If you’re thinking about installing a wood burning stove there are quite a few things you need to sort out before you can actually go ahead. First, there is almost certainly going to be legislation related to smoke control/air pollution that you may have to consider. Certain localities (urban situations for example) may outright ban all forms of smoke, in which case your plans for a wood burner can also go up in smoke (of the metaphorical kind). Then you need to establish if your house itself can comply with local planning and building regulations. For example, you are going to need some form of chimney or stovepipe to allow the hot gas and smoke to vent to the outside. Clearly, if you don’t already have a chimney then you will need to apply to build one; but even if you do then chances are that it will need to be fitted with a Class A UL Approved steel liner in order to cope with the very high temperatures that wood stoves create. 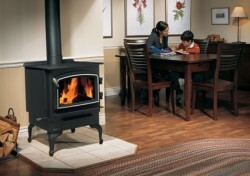 Even simple details such as where exactly are you going to put the wood stove need to be properly though out. It not only wants to be somewhere visually appealing but also safe, functionally useful and with access to a flue to vent the smoke outside. These are all issues you absolutely must have fully nailed down before you even think about specific stoves. Once you’ve sorted out the preliminary logistics and decided where the stove is to be situated inside (somewhere aesthetically pleasing yet safe and with suitable access to the chimney) then you can begin to focus on specific types of wood burner. Where wood burning stoves are concerned the choice can seem quite bewildering. Not only is there the astounding variety of different terms that describe essentially the same thing, such as wood burner, wood stove, wood burning boiler, log fueled range, log burning stove, bio-fuel boiler and so forth, but there are also genuine fundamental differences in functionality buried in all this confusing terminology. One of the best ways to cut through the jargon is by simply deciding which basic function(s) you want. Wood burners can act as simple space heaters to bring aesthetic appeal and radiant heat to a single room, as whole house heating systems that service radiators and the hot water tank, and as cooking appliances. That said, it is possible to purchase wood burning stoves that incorporate two or even all three of these basic functions. The Aga/Rayburn kitchen range for example looks lovely and keeps your kitchen really cozy while also providing two ovens, two hobs and a boiler able to manage a typical household’s entire central heating and hot water needs. When you have decided on the required functionality (hot water/heating/cooking/aesthetics) the final choice is simply a small matter of style; namely whether to go for the traditional versus contemporary look. By this stage you should hopefully have reduced the field to a manageable number of suppliers and possible products from which to make your final decision. NextElectrolux Vacuum: Perfect for Your Cleaning Needs!